Large cruise ships dock in this port. 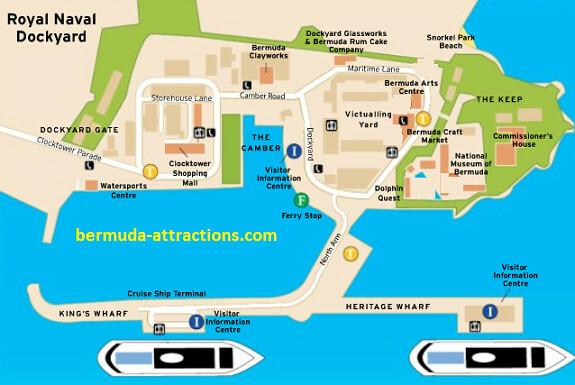 The sprawling Royal Naval Dockyard six-acre complex gives visitors plenty to do and see. You are either docked at King's Wharf or Heritage Wharf, right next to each other. Take from here the 20 minute ferry or taxi to downtown Hamilton. It is much faster than taking the bus. Bus 7 or 8 leaves the for the City of Hamilton from the Royal Naval Dockyard Mon–Sat every 15 min. 6:45am–11:45pm. The trip takes 1 hr. and costs $4.50 for adults, $1 for children. Drivers accept this exact bus fare in coins only. Also there is a mini-bus shuttle between King's Wharf and Horseshoe Bay beach. 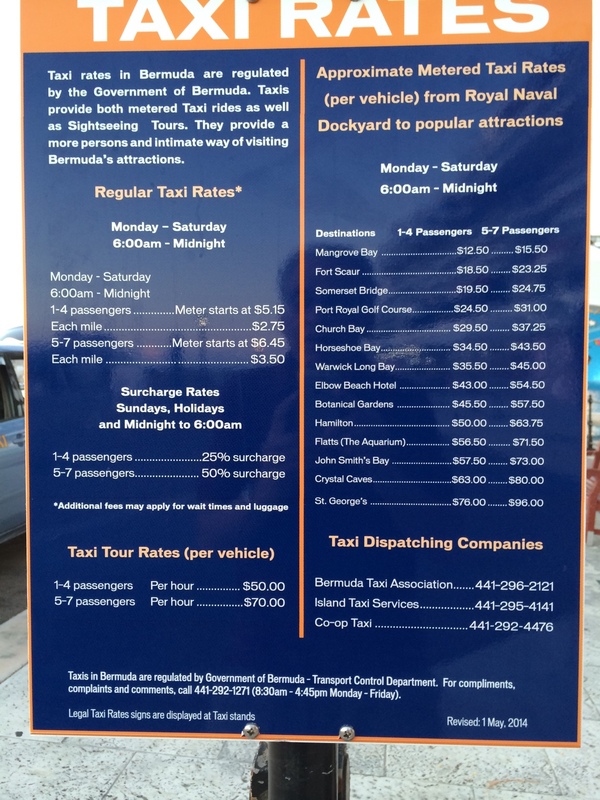 It runs to the beach continuously between 8 a.m. to 3 p.m. Last shuttle back to the cruise ship terminal is at 6 p.m. $16 pp. The Royal Naval Dockyard in itself, with its National Museum of Bermuda, is the number one tourist attraction on Bermuda. Even if you plan to spend all your precious time on Bermuda’s pink sandy beaches, try to schedule some hours to check it out. National Museum of Bermuda, Maritime Lane , Take 1/2 a day to go to the Royal Naval Dockyard. After the loss of its naval bases during the American Revolutionary War, the British Royal Navy relocated the headquarters of its Atlantic Fleet here from 1812 to 1957. The old limestone storage buildings, keep and fortress have been wisely redeveloped by the Bermuda Government into a tourist attraction and shopping center. Bermuda Aquarium, Museum, and Zoo, 40 North Shore Road, Flatts Village, Daily 9AM-5PM (last admission 4PM). Center pieced by a 140,000 gallon replica coral reef, this one of Bermuda's main attractions. Over three hundred birds, reptiles and mammals and 200 species of fish. Adults $10, Seniors $5, ages 5 to 12 $5. Crystal and Fantasy Caves, Wilkinson Avenue, Bailey's Bay, Daily 9:30AM-4:30PM (last admission 4:00). Two quite different caves to see. The islands benefit from an excellent and frequent bus service, which connects all parts of the islands to Hamilton. The buses are used equally by locals and visitors. When catching a bus look out for the pink and blue painted poles which denote bus stops; pink indicates buses to Hamilton; blue from Hamilton. Out on the pier, turn right for visitors’ info, maps & printed guides to tourist sites - freely available. The Visitor Info Booth beyond the gift stand sells the unlimited Day Pass for buses & ferries ($12 for 1 day or $20 for 2 days) – printed bus & ferry schedules are given, along with a mini Bermuda guide. Passing the moped/scooter rental stand & lines of waiting taxi, the ferry terminal ahead is about a 5 minutes’ walk – with posted signs & lines for Hamilton and St. George. The bus stop for the 1 hour trip to Hamilton is also there – if there is a long line of folks waiting, take the SeaExpress ferry to town. Island tour: Take the ferry to St George then the bus to Hamilton. You could then change buses and take the #7 bus along the south shore back to the dockyard. It takes longer than the ferry but you get to see more of the Island. You could even make a stop at Horseshoe Bay or one of the other beaches on your way back. Bermuda Railway Trail. What used to be a railway track once, is now converted into a fantastic walking trail in Bermuda. In 1948 the Bermuda government closed down the railways as they thought it was no longer required. And in 1984 they transformed this into a fantastic trail for the walkers and cyclists. Any bike rental shop will give you directions. A nice assortment of stores exists in Hamilton, especially on Front Street. The area can be explored easily by foot. The restaurants in close proximity to the cruise ship docks in, say, St. George's can be as much as three times as expensive as a comparable one in, say, Somerset Village. Bermuda's currency is the Bermudian dollar, which has the same value as US$. US dollars are accepted everywhere, make sure you get change back in US$. The principal language spoken is English. The following are public holidays in Bermuda: new year's day; Good Friday; Bermuda day (24 May); HM the Queen's Birthday (June); Emancipation day (end of July); Somers day (end of July); Labor day (first Monday in September); Remembrance day (11 November); Christmas day; Boxing day. Most stores and banks are closed on above days.